Apologies for being so quiet here at the 2SS headquarters! We are still here… I guess we have just been busy with day-to-day life! But we promise we will make it up to you! We have some very exciting blogs underway, we can hardly wait to share them with all of you! With summer on its way (I can hear my bikinis teasing me already from the back of my drawers) I’m attempting to eat a tad bit healthier. So when the weather did a 360 on the weekend and decided to be cold again, I was craving a homemade curry. Rather than making my standard beef or chicken curry, I decided to jam pack it with veggies and add tofu as my meat substitute. This curry is super easy and quick, so can be made when you are rushed for time. 1. In a small saucepan, boil carrots and beans in lightly salted water for 3 minutes and drain. 2. In a wok, bring the coconut milk and 1/2 cup of water to the boil. Stir in curry paste and simmer for about 1 minute, until dissolved. 3. 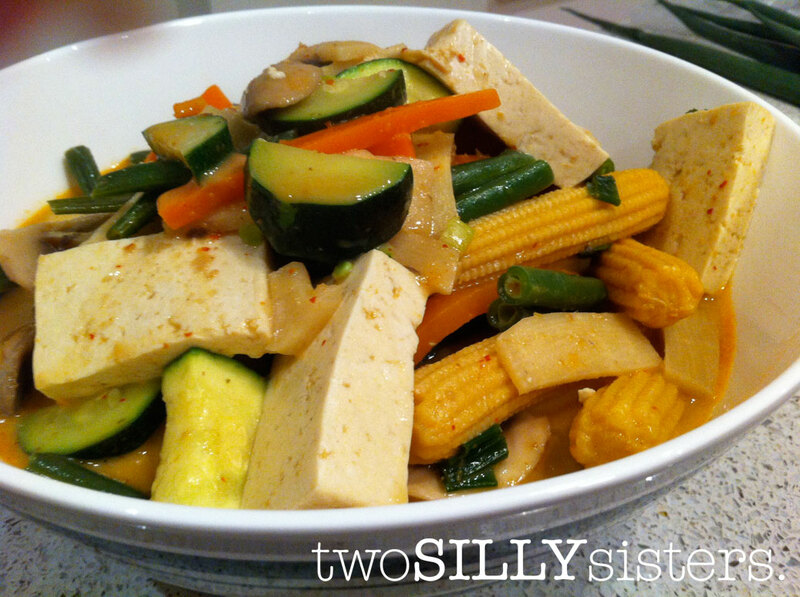 Add all the vegetables and tofu to the coconut milk and stir. Add a generous squirt of fish sauce and simmer for 3-5 minutes until vegetables are tender. 4. Remove from heat and add a squeeze of lime juice to taste. Serve with rice. * If you want to make this dish 100% vegetarian, you can substitute the fish sauce with GF soy sauce or tamari. Or simply season with salt and pepper.